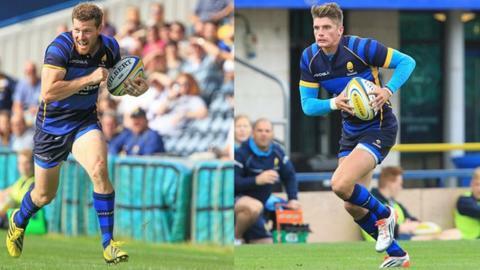 Worcester Warriors centre Max Stelling and reserve full-back Ben Howard have both signed new, unspecified-length deals at the promoted Premiership club. Stelling, 21, was second top try scorer with 17 last season until missing the promotion run-in because of injury. England Under-20 cap Howard, 22, showed such good form as cover for the injured Chris Pennell that he was voted supporters' young player of the year. He regularly deputised on the wing, scoring seven tries in 23 appearances. Max Stelling made his Warriors debut on the day Ben Howard made his first start in October 2012, in the Challenge Cup game against Spanish side Bizkaia Gernika. Worcester posted their biggest-ever score in Europe as they won 85-5, scoring 13 tries, of which Howard got two and Stelling came off the bench to claim a hat-trick. Warriors director of rugby Dean Ryan said: "Max and Ben have shown tremendous professionalism over the last two years as they've made the transition from the Academy to the first team. "Developing young talent is integral to this club and they are a fine example of what we're trying to build here at Sixways. Two very talented youngsters who are yet to realise their full potential." Meanwhile, Warriors have allowed winger Dean Hammond and centre Heath Stevens to join Championship side Nottingham on loan. Warriors, who lost 52-30 in a pre-season friendly at home to Premiership rivals Wasps at Sixways on Saturday, face their final warm-up match at reigning champions Saracens this Saturday. Ryan's men then open the new domestic season, delayed because of the Rugby World Cup, on 16 October with a home game against Northampton Saints.